Anaemia, defined as a reduction in haemoglobin concentration, red-cell count, or packed-cell volume below established cut-off levels, is a widely discussed public health challenge that India is facing. According to the World Health Organization (WHO), anaemia among women is defined as a haemoglobin concentration of <120 g/L for non-pregnant women aged 15 years and above, and a haemoglobin concentration of <110-g/L for pregnant women. In particular, a persistently high level of anaemia among women in India (53% of all women have anaemia as per the National Family Health Survey 2015–20163) is of great concern, and the 2017 National Health Policy tabled by the Ministry of Health and Family Welfare, Government of India, acknowledges this high burden. Iron-deficiency anaemia (IDA) is a common problem among women, primarily due to their recurrent menstrual loss. Demand for iron is higher among pregnant women, and women with anaemia in combination with early onset of childbearing, a high number of births, short intervals between births and poor access to antenatal care and supplementation are likely to experience poor pregnancy outcome. Prevention and management of IDA demands adequate iron intake and provision of bioavailable iron. The most recent estimates reflect an unacceptably low consumption of iron (median: 13.7 mg/day per person) among women in India aged ≥18 years and 51–83% of pregnant women in India are deprived of the recommended daily allowance of iron of 15–18 mg/day. Women in India largely derive iron from non-haem, inorganic sources, including grains, plants, cereals, lentils and vegetables; and, to a small extent, from iron supplements, such as iron or iron and folic acid (IFA) tablets for pregnant women, and iron-fortified foods, as compared to sources of haem iron such as meat and fish, which have a higher rate of absorption., Thus, it is not surprising that India has the highest number of women with anaemia globally, which increases the probability of maternal and child mortality and has significant economic implications for the nation's development. A recently published study on the burden of disease in India concluded that the burden of IDA is 3.0 times higher than the average globally for other geographies at a similar level of development, and that women are disproportionately affected. The report also highlighted that between 1990 and 2016, the burden of IDA improved little and was the top cause of the years lived with disability (11% of all disability) in 2016., With this background, using three consecutive waves of published reports of the National Family Health Survey (NFHS, equivalent to a demographic and health survey) conducted during 1998–1999 (NFHS2), 2005–2006 (NFHS3)13 and 2015–2016 (NFHS4), this article discusses the changes in the burden of anaemia and the extent to which the levels of IFA intervention may have contributed to addressing this challenge for women of reproductive age (15–49 years), especially pregnant women. To tackle IDA, India was the first country to launch a National Nutritional Anaemia Prophylaxis Programme in 1970., The National Nutrition Policy was launched in 199316 and this formed the basis for the National Plan of Action on Nutrition 1995, which laid out the sectoral Plan of Action to tackle anaemia. In light of the high burden of anaemia in India, one of the goals of the 12th Five Year Plan (2012–2017) of the Government of India was to reduce anaemia in girls and women by 50% – that is to 28% by 2017., In 2013, the Ministry of Health and Family Welfare developed an intervention guideline – the National Iron+ Initiative – to mitigate the burden of IDA. On 1 December 2017, the Union Cabinet approved setting up of the National Nutrition Mission under the oversight of the Ministry of Women and Child Development. Among many targets, the National Nutrition Mission aims to reduce anaemia among young children, adolescent girls and women of reproductive age (15–49 years) by one third of NFHS4 levels by 2022. The aim of the National Iron+ Initiative was to target IDA across all life stages, thus expanding existing guidance for children, pregnant women and lactating mothers, to include adolescents (both boys and girls aged 10–19 years) and women of reproductive age (15–49 years). With respect to adolescents, the National Iron+ Initiative expanded on the 2012 Weekly Iron and Folic Acid Supplementation programmes for girls in and out of school, to include boys as well. Interventions with women of reproductive age are a recent endeavour under the National Iron+ initiative approved by the Ministry. According to the guideline, the primary intervention to tackle IDA is to administer IFA supplementation with elemental iron and folic acid, using a regimen that varies according to the intervention group (see [Table 1]). WHO has developed guidelines for daily iron supplementation for pregnant women and girls, infants and children and non-pregnant women and adolescent girls. However, in some cases, iron doses prescribed in the National Iron+ Initiative differ from the WHO recommendation. Data from the NFHS in India have been widely used to make national and state-level policy decisions. Estimates from the NFHS indicate that during the period 1998–2016, over 50% of women aged 15–49 years had IDA (see [Table 2]). Of all the states and union territories, data for 27 were available for comparison between 2005–2006 and 2015–2016. 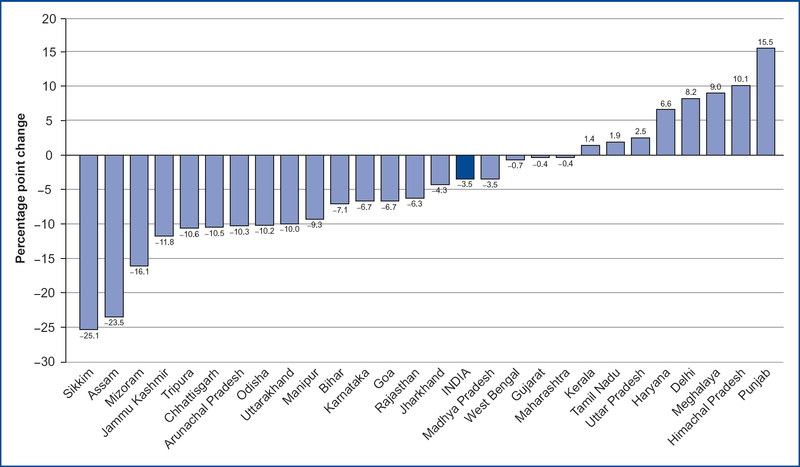 There was an average decrease of only 3.5 percentage points in IDA among all women in India, varying by states (see [Figure 1]). In addition, NFHS4 (2015–2016) indicates that the National Iron+ Initiative did not yield the desired reduction in IDA nationally. This suboptimum reduction in IDA is highly concerning. However, during the same period, of the 27 states compared in [Figure 1], IDA in eight states increased: Delhi-National Capital Territory, Haryana, Himachal Pradesh, Kerala, Meghalaya, Tamil Nadu, Punjab and Uttar Pradesh. This raises an alarming question – how did some states in India such as Delhi-National Capital Territory, Himachal Pradesh, Kerala and Punjab, which rank among the highest on the state Human Development Index (HDI), fail to contain IDA and instead join Uttar Pradesh, one of the lower-ranked HDI states? This question demands further investigation. As the standard national guideline is in place, the next question is whether girls and women were receiving the recommended supplementation of IFA that is to be distributed through school teachers/anganwadi workers to adolescent girls; through auxiliary nurse midwives/accredited social health activists to pregnant and lactating mothers; and through accredited social health activists to women of reproductive age (15–49 years; see [Table 1]). Although no evaluation study has yet been conducted to measure the effect of IFA supplementation, some observational studies have indicated that IFA intervention has helped to improve haemoglobin levels in adolescent girls in India., However, poor uptake and adherence remains a challenge to India's public health system. Nationally in the NFHS4 2015–2016 survey, over 50% of pregnant women were diagnosed with IDA and an average of only 30.3% of mothers consumed IFA for 100 days or more when they were pregnant in the 5-years preceding the survey; this ranged from the lowest in Nagaland (4.4%) to the highest in Lakshadweep (82.1%; see [Table 2]). The national policy of India dictates that pregnant and lactating mothers should be given 100 mg elemental iron and 500 μg folic acid daily, which is a much higher dose than that recommended by WHO (30–60 mg elemental iron). Irregular consumption of IFA during pregnancy may be due to its side-effects and its unacceptable metallic taste; there are significant gastrointestinal side-effects associated with the higher iron dose, which are likely to explain the poor adherence. Furthermore, stock-outs due to limited supply chains and suboptimum monitoring at the community level where poor socioeconomic conditions prevail are likely to compound the situation. A recent Cochrane systematic review concluded that pregnant women who intermittently receive iron supplementation are less likely to report side-effects (such as constipation and nausea), as compared to those who receive a daily regimen. Another systematic review suggests that compliance with IFA supplementation could be higher among those who have been counselled by health workers, especially when forgetfulness is the primary reason for low uptake of IFA in India. In 2013, the Ministry of Health and Family Welfare designed a guideline, the National Iron+ Initiative, that gave specific direction for screening and therapeutic management of anaemia among women of reproductive age (15–49 years). Although this initiative is in place, generalized practice of the guideline at facility and clinical level seems lacking. Non-pregnant women, especially in rural India, whose anaemia remains undiagnosed for various reasons, follow a different path of treatment from that recommended. The expectation is that if a woman is sick (owing to anaemia or any other reason) and she goes to a health facility, blood tests including a haemoglobin test are only recommended if the attending physician has enough time to examine the patient, and accordingly iron tablets may be prescribed. Alternatively, if anaemia is suspected through physical examination, the physician will recommend IFA supplementation as part of her daily regimen. This means that, in general in India, a woman must already be sick to be diagnosed with anaemia. In addition, the guidance is to distribute IFA tablets to all pregnant women, irrespective of their haemoglobin level. Prior to the National Iron+ Initiative, the guidance was that pregnant women should be given IFA in prophylactic doses, with a double dose if they had IDA. Also, irrespective of pregnancy status, for those with severe IDA there is a provision to administer blood transfusions if recommended by the physician. This implies that the treatment of IDA (by administering either a prophylactic dose or a higher dose in the case of severe anaemia) depends on the haemoglobin level of pregnant women. A common error in this IFA distribution system is to put all women in the same bracket and administer the same dose. Women with anaemia therefore continue to be anaemic, thus increasing the burden to the nation. These dynamics of anaemia need to be understood before a “one size fits all” strategy is applied. The situation is even worse for individuals in underserved groups, including those who are poor or uneducated, or who belong to historically underprivileged social groups (women from scheduled castes and scheduled tribes), and those living in rural areas; these groups are all likely to experience reduced access to diagnosis. The accuracy of data on access to, and compliance with, IFA supplementation during pregnancy is problematic because of the way questions are asked and reported in the NFHS. In the women's questionnaire for the survey, eligible women are asked about their intake of IFA during their last pregnancy (in NFHS4, 2015–2016, women were asked about their most recent pregnancy since January 2010). If a woman confirms any incidence of pregnancy, she is asked by the interviewer, “During this pregnancy, were you given or did you buy any iron and folic acid tablets or syrup?”. If the answer is affirmative, the follow-up question is, “During the whole pregnancy, for how many days did you take the tablets or syrup?”. If the response is not numeric, the respondent is probed for an approximate number of days, by asking how many months pregnant she was when she began taking the tablets and whether she took the tablets every day after that. It is difficult to assess the reliability of answers on all possible measures for a 5-year reference period. As data on the proportion of women who require probing are not available, it would not be appropriate to offer a figure on the extent of distortion in the reporting of IFA consumed. Secondly, even if a respondent comes up with a figure in response to the probe, there is no guarantee that the count of IFA is correct, as there may be recall errors and a propensity to inflated reporting, owing to social desirability bias. The protocol for data collection in the NFHS is not designed to capture this methodological gap. An alternative source of data is available if a woman's pregnancy is registered with a subcentre (the lowest level of health-care facility in India). In these circumstances, the pregnant woman is provided with a mother–child protection card, where the number of IFA supplements delivered to her by the community health workers is recorded. However, owing to challenges to the performance of community health workers in pregnancy management and maternal care in different states, these data are also likely to be unreliable records of the actual number of IFA supplements either delivered or consumed. Therefore, while data on IFA consumed must be approached with caution, the failure of IFA interventions to date to address the challenge of IDA is apparent and requires greater scrutiny for future programming. From the above discussion, a high burden of IDA is evident in India and the data on IFA supplements consumed are discouraging. Trends in anaemia since 1998–1999 give reason for scepticism about the future impact of an IFA intervention alone on IDA in India. WHO recommends that, to reduce the level of IDA, India should strengthen its strategy along three pillars – food-based strategies (dietary diversification and food fortification), food supplementation and improvement of health services. Among these three, food fortification together with dietary diversification is deemed a more sustainable alternative, but better implementation strategies are required to increase uptake. With the advent of The National Food Security Act, 2013, legal commitments have been made to supplement nutrition for adolescent girls and pregnant and lactating mothers. However, the latest round of NFHS data calls for a reality check and reflection on schemes and policies that have been developed to tackle IDA among women. The National Health Policy 2017 offers some hope, with a recommendation for community-based screening for IDA and its treatment. The present study calls for introduction of a nutrition-awareness intervention with intense monitoring of IFA distribution and uptake, especially among prospective mothers and pregnant women. Intensified action of community-level health workers (such as accredited social health activists and auxiliary nurse midwives) could help to target women with severe IDA, who need urgent attention, to reduce the rate of anaemia more quickly. Above all, strengthening the health system, and monitoring and evaluation of interventions for the prevention and treatment of anaemia are the most urgent needs, but are clearly not being done rigorously at present. Authorship: RKR conceived and designed the study, performed the analysis and prepared the first draft. WWF, AB and AC reviewed the results and contributed to finalizing the report. All authors approved the study. Nutritional anaemias: tools for effective prevention and control. Geneva: World Health Organization; 2017 (http://apps.who.int/iris/bitstream/10665/259425/1/9789241513067-eng.pdf, accessed 15 January 2018). Ministry of Health and Family Welfare, Government of India. India National Family Health Survey (NFHS4) 2015–16. Mumbai: International Institute for Population Sciences; 2017 (http://rchiips.org/nfhs/NFHS-4Reports/India.pdf, accessed 15 January 2018). National Health Policy 2017. New Delhi: Ministry of Health and Family Welfare, Government of India; 2017 (http://cdsco.nic.in/writereaddata/National-Health-Policy.pdf, accessed 15 January 2018). Camaschella C. Iron-deficiency anemia. N Engl J Med. 2015;372(19):1832–43. doi:10.1056/NEJMra1401038. Shankar B, Agrawal S, Beaudreault AR, Avula L, Martorell R, Osendarp S et al. Dietary and nutritional change in India: implications for strategies, policies, and interventions. Ann N Y Acad Sci. 2017;1395(1):49–59. doi:10.1111/nyas.13324. Deaton A, Drèze J. Food and nutrition in India: facts and interpretations. Econ Polit Wkly. 2009;44:42–65 (https://www.princeton.edu/~deaton/downloads/Food_and_Nutrition_in_India_Facts_and_Interpretations.pdf, accessed 15 January 2018). Mehta R, Platt AC, Sun X, Desai M, Clements D, Turner EL. Efficacy of iron-supplement bars to reduce anemia in urban Indian women: a cluster-randomized controlled trial. Am J Clin Nutr. 2017;105(3): 746–57. doi:10.3945/ajcn.115.127555. Guidelines for control of iron deficiency anaemia. National Iron+ Initiative. Towards infinite potential in an anaemia free India. New Delhi: Ministry of Health and Family Welfare, Government of India; 2013 (http://www.pbnrhm.org/docs/iron_plus_guidelines.pdf, accessed 15 January 2018). India: health of the nation's states. The India State-Level Disease Burden Initiative. New Delhi: Indian Council of Medical Research, Public Health Foundation of India and Institute for Health Metrics and Evaluation; 2017. (http://icmr.nic.in/publications/India_Health_of_the_Nation's_States_Report_2017.pdf, accessed 15 January 2018). Dandona L, Dandona R, Kumar GA, Shukla DK, Paul VK, Balakrishnan K et al. ; India State-Level Disease Burden Initiative Collaborators. Nations within a nation: variations in epidemiological transition across the states of India, 1990–2016 in the Global Burden of Disease Study. Lancet. 2017;390(10111):2437–60. doi:10.1016/S0140-6736(17)32804-0. 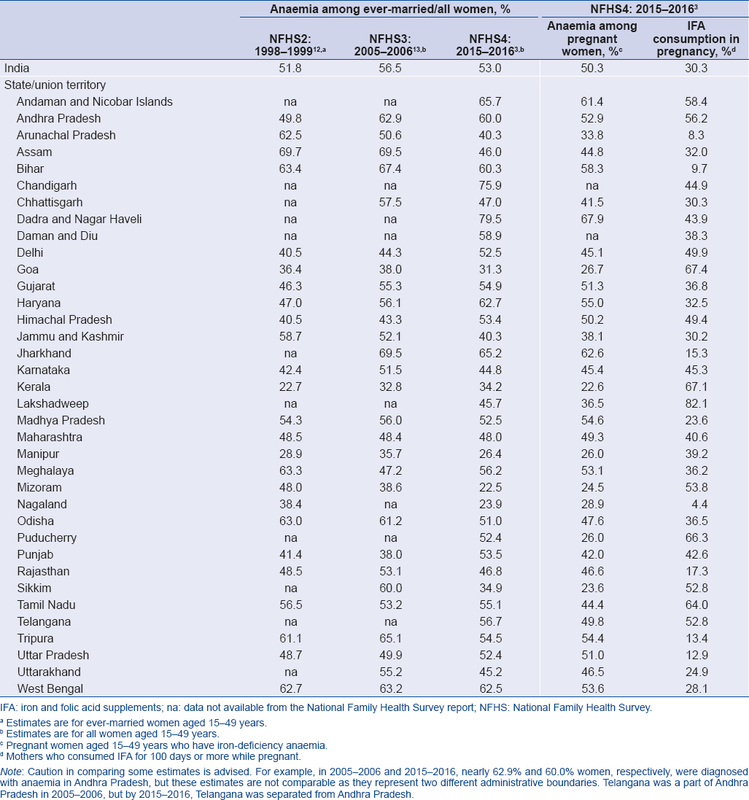 India National Family Health Survey (NFHS2) 1998–99. Mumbai: International Institute for Population Sciences; 2000 (https://dhsprogram.com/pubs/pdf/frind2/frind2.pdf, accessed 15 January 2018). Ministry of Health and Family Welfare, Government of India. India National Family Health Survey (NFHS3) 2005–06. Mumbai: International Institute for Population Sciences; 2007 (https://dhsprogram.com/pubs/pdf/frind3/frind3-vol1andvol2.pdf, accessed 15 January 2018). Anand T, Rahi M, Sharma P, Ingle GK. Issues in prevention of iron deficiency anemia in India. Nutrition. 2014;30(7–8):764–70. doi:10.1016/j.nut.2013.11.022. Nutrition and Health Education. National Nutritional Anaemia Prophylaxis Programme (NNAPP) (http://nutrition-health-education.blogspot.co.uk/2014/01/national-nutritional-anaemia.html, accessed 15 January 2018). National Nutrition Policy 1993. New Delhi: Government of India Department of Women and Child Development, Ministry of Human Resource Development; 1993 (http://wcd.nic.in/sites/default/files/nnp_0.pdf, accessed 15 January 2018). National Plan of Action on Nutrition. New Delhi: Food and Nutrition Board, Ministry of Women and Child Development, Government of India; 1995 (http://www.nipccd-earchive.wcd.nic.in/sites/default/files/PDF/National%20Plan%20of%20Action%20on%20nutrition%20-1995.pdf, accessed 15 January 2018). Planning Commission Government of India. 12th Five Year Plan (2012–2017). Social sectors. Volume III. New Delhi: Sage Publications India Pvt Ltd.; 2013 (http://planningcommission.gov.in/plans/planrel/12thplan/pdf/12fyp_vol3.pdf, accessed 15 January 2018). Cabinet approves setting up of National Nutrition Mission. Press release. New Delhi: Press Information Bureau, Government of India; 2017 (http://pib.nic.in/newsite/PrintRelease.aspx?relid=174025, accessed 15 January 2018). Operational Framework. Weekly Iron and Folic Acid Supplementation Programme for adolescents. New Delhi: Ministry of Health and Family Welfare, Government of India; 2012 (http://tripuranrhm.gov.in/Guidlines/WIFS.pdf, accessed 15 January 2018). WHO recommendations on antenatal care for a positive pregnancy experience. Geneva: World Health Organization; 2016 (http://apps.who.int/iris/bitstream/10665/250796/1/9789241549912-eng.pdf?ua=1, accessed 15 January 2018). WHO guideline: daily iron supplementation in infants and children. Geneva: World Health Organization; 2016 (http://apps.who.int/iris/bitstream/10665/204712/1/9789241549523_eng.pdf?ua=1&ua=1, accessed 15 January 2018). WHO guideline: daily iron supplementation in adult women and adolescent girls. Geneva: World Health Organization; 2016. (http://apps.who.int/iris/bitstream/10665/204761/1/9789241510196_eng.pdf, accessed 15 January 2018). Dandona R, Pandey A, Dandona L. A review of national health surveys in India. Bull World Health Organ. 2016;94(4):286–96A. doi:10.2471/BLT.15.158493. Vir SC, Singh N, Nigam AK, Jain R. Weekly iron and folic acid supplementation with counseling reduces anemia in adolescent girls: a large-scale effectiveness study in Uttar Pradesh, India. Food Nutr Bull. 2008;29(3):186–94. doi:10.1177/156482650802900304. Malhotra S, Yadav K, Kusuma YS, Sinha S, Yadav V, Pandav CS. Challenges in scaling up successful public health interventions: lessons learnt from resistance to a nationwide roll-out of the weekly iron-folic acid supplementation programme for adolescents in India. Natl Med J India. 2015;28(2):81–5 (http://archive.nmji.in/archives/Volume-28/Issue-2/Medicine-and-Societies-I.pdf, accessed 15 January 2018). Peña-Rosas JP, De-Regil LM, Gomez Malave H, Flores-Urrutia MC, Dowswell T. Intermittent oral iron supplementation during pregnancy. Cochrane Database Syst Rev. 2015;(10):CD009997. doi:10.1002/ 14651858.CD009997.pub2. Kavle JA, Landry M. Community-based distribution of iron-folic acid supplementation in low- and middle-income countries: a review of evidence and programme implications. Public Health Nutr. 2018;21(2):346–54. doi:10.1017/S1368980017002828. Revised guidelines for prevention of maternal anaemia. Chennai: Tamil Nadu State Department of Health and Family Welfare; 2007 (http://www.nrhmtn.gov.in/guideline/RGPMA.pdf, accessed 15 January 2018). Balarajan YS, Fawzi WW, Subramanian SV. Changing patterns of social inequalities in anaemia among women in India: cross-sectional study using nationally representative data. BMJ Open. 2013;3(3):e002233. doi:10.1136/bmjopen-2012-002233. National Family Health Survey, India 2015–2016 (NFHS4). Woman's questionnaire. Mumbai: International Institute for Population Sciences; 2014 (http://rchiips.org/NFHS/NFHS4/schedules/NFHS-4Womans.pdf, accessed 15 January 2018). National Family Health Survey, India 2015–16 (NFHS4). Interviewer's manual. Mumbai: International Institute for Population Sciences; 2014 (http://rchiips.org/NFHS/NFHS4/manual/NFHS-4%20Interviewer%20Manual.pdf, accessed 15 January 2018). Bajpai N, Dholakia RH. Improving the performance of accredited social health activists in India. Working Paper No. 1. Mumbai: Columbia Global Centers; 2011 (https://www.researchgate.net/publication/265121185_Improving_the_performance_of_Accredited_Social_Health_Activists_in_India_Working_Paper_No_1, accessed 15 January 2018). Gera T, Sachdev HS, Boy E. Effect of iron-fortified foods on hematologic and biological outcomes: systematic review of randomized controlled trials. Am J Clin Nutr. 2012;96(2):309–24. doi:10.3945/ajcn.111.031500. Ministry of Law and Justice. The National Food Security Act, 2013. New Delhi: The Gazette of India, Government of India; 2013 (http://indiacode.nic.in/acts-in-pdf/202013.pdf, accessed 15 January 2018).